Like the Bronx Cheer, Christmas cheer can often be loud and obnoxious. Whether it is bad carolers insisting that you stop and listen to them flatly yell Jingle Bells, homeless people in dirty Santa costumes yelling at you for not giving them enough change, or drunken coworkers at the staff party loudly and with an extended slur proclaiming their hatred of the boss, for all (including said boss) to hear, at this time of year, we are surrounded by Christmas cheer. Now if it sounds like I’m down on Christmas, you’ve got me all wrong. It is the above instances that make the holidays fun for me, and to that end, I’ve sought out ways in which to ensure that the holidays have flavor, and are not completely stifled with artificial smiles and niceties, but are also about Grandma telling Mom that she should’ve never married Dad, but instead that nice Harvey Finklestein (he’s a successful doctor now, don’t you know?). How do I go about ensuring that the holidays have self-made entertainment, you ask? In one word: Punch. Punch is that sneaky silent weapon that turns boring office parties into raucous affairs, and ensures that your family get-togethers bring out all of your relatives closeted skeletons. Punch has the ability to masquerade as a simple, easily quaffed beverage, while in reality it hides the punch of a Mike Tyson (in his early days) behind the skirt of floating fruit and sparkling wine. 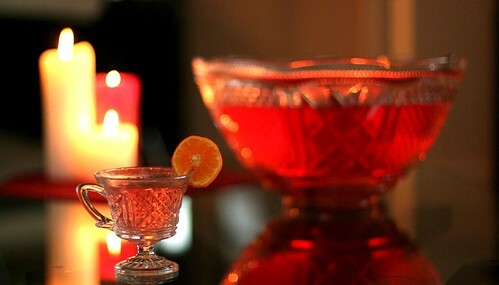 And, most importantly (to a lazy bartender who doesn’t want to work on his day off), punch is incredibly easy to make. The biggest mistake that one can make when throwing together a punch is to add too much hard alcohol to the mix, making the final libation taste too strong. My theory is that people are going to get blotto off of the punch anyway, so let’s make the concoction approachable to everyone. The key to doing this is to make a lighter spirit your base and as such, I usually use sparkling wine. Next you want to add some liqueurs to the mix, in order to sweeten the batch and add flavor. The liqueurs are up to you, but I caution not to use too much, or the headache that will follow the next day will be tortuous. Finally, you need to add some fruit and/or something to balance out the liqueurs that you’ve added. I’ve found that slices of tart citrus (with the bitter pith attached) work as a great foil to the liqueurs sweetness, as do healthy doses of bitters. To ensure that your punch is cold and not too watery, place all of the ingredients in a fridge the day before, and try to find the biggest piece of ice that will fit in your punch bowl. Remember, the bigger the ice, the slower the rate of melting and the colder your drink will be. This is a delicious, easy to make punch that will be enjoyed by people of all palates. It is important to use a big block of ice in punches, as you want the punch to be cold and not watery. If you can’t make the ice dome outlined, just buy a block of ice from your local grocery store, and chisel it down until it fits in your punch bowl. If you’re wondering about the name of my punch, it is the scientific designation of Punch-Drunk Syndrome, which as the evening progressed and more punch was consumed, we all experienced (especially the morning after, for those of us who hadn’t been downing equal servings of water with our punch). ~ by Jamie Boudreau on December 23, 2007. Hmm, this coming week’s Drink of the Week bears more than a passing resemblance to your punch… so now you’ve been reading MY drafts?! Hi, is it rite to only study from books not to pay a visit world wide web for most up-to-date updates, what you say friends?